As you guys know, Molly turned two at the beginning of this month! 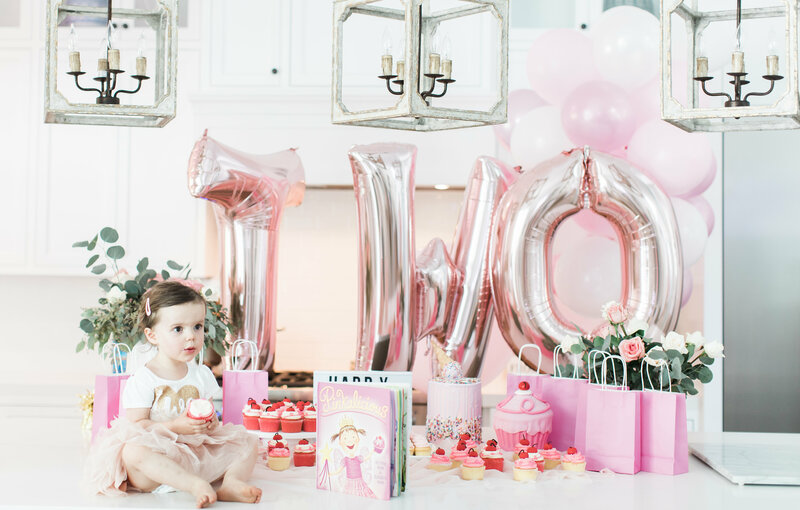 I can’t believe it’s taken me this long to blog about her party. 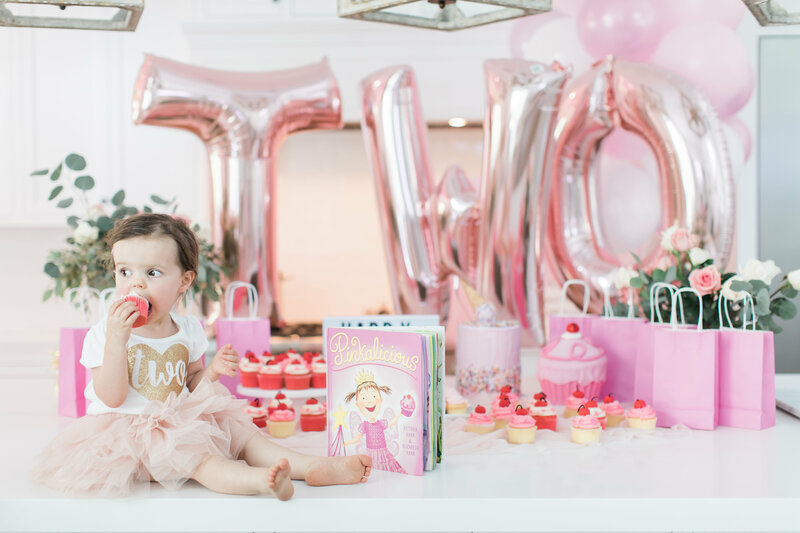 When she turned one I think I had a blog post up the day after the party. I guess that’s one of the differences between having one child and two. There just aren’t enough hours in the day to do everything we want to! Oh well, better late than never right?! And since I don’t have a ton of time (even right now to write this), I’m mostly just going to share photos and link some of the things I used below the photos. To start things off I’m going to talk about my lack of time once again. Is that three times already in this post? And it’s only a few sentences long so far. Ha! But I have to mention it again because I have to share that I planned this party and ordered everything in about two days. Meaning only two days before the party. Talk about last minute. Most of the stuff I ordered on Amazon with two day shipping or got locally. It’s just that Molly’s party snuck up on me and I wasn’t prepared at all. 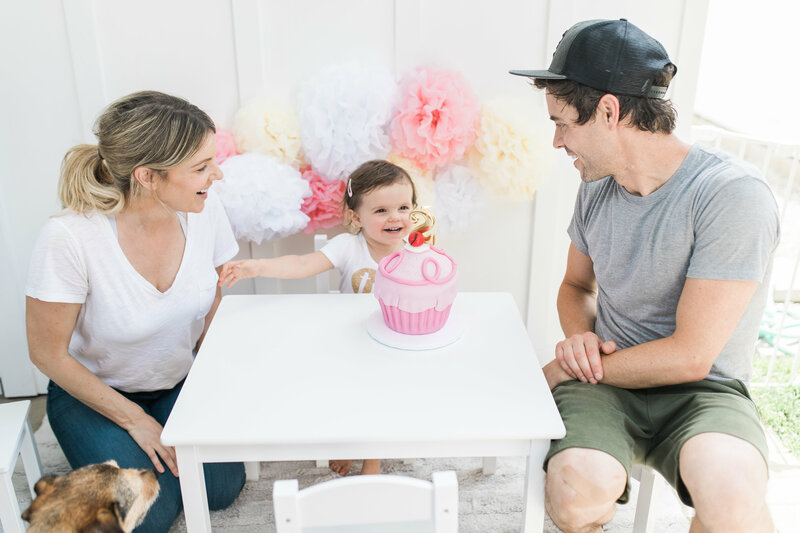 For her first birthday party, I think I planned for it months in advance. Maybe not, my memory is a little bit fuzzy. But I know I was much more prepared and ordered things on Etsy that took a few weeks to arrive. 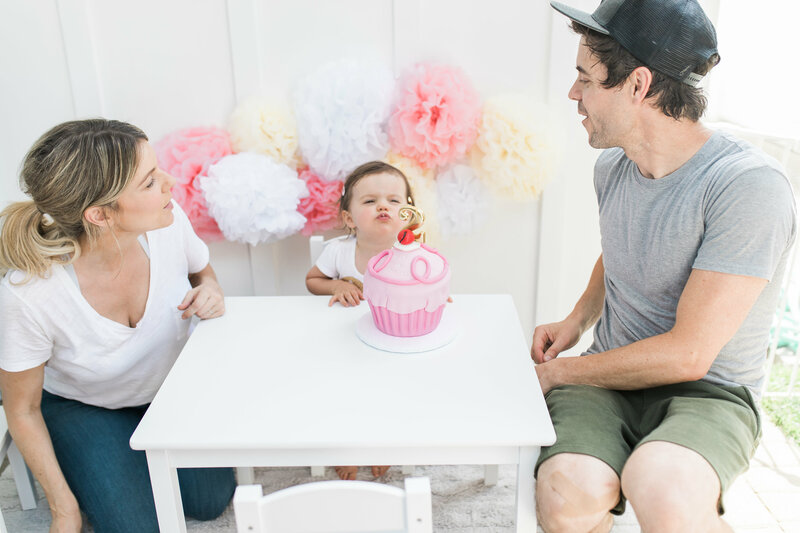 But for her second party, with Riley only being six weeks old at the party, there just wasn’t much time to plan. 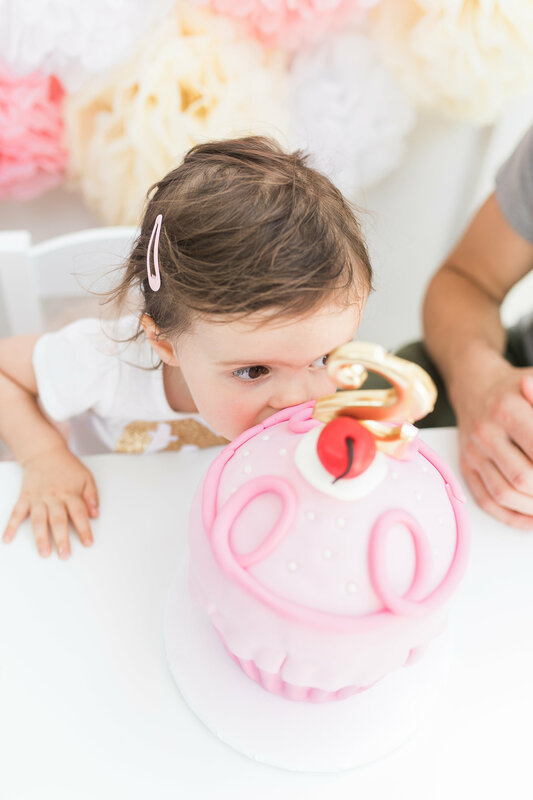 So hopefully if anyone out there is googling for birthday ideas for a two-year-old and need some last minute ideas, this will give them some inspiration! 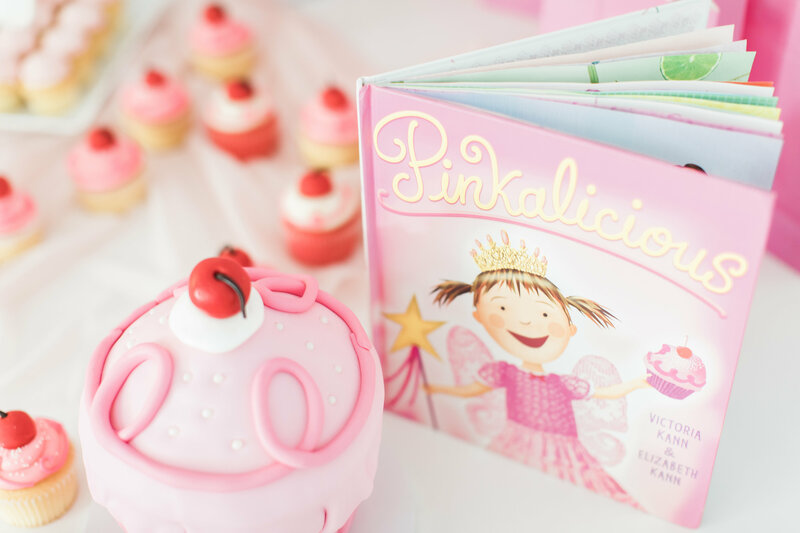 Especially if your little one likes pink and the book Pinkalicious. Molly absolutely loves Pinkalicious! I think I could “read” the book front to back without even looking at a single page. If I had to guess, I’d say I probably read it to her three or four times a day. And that’s just this book. There are other books I read her even more than that each day. 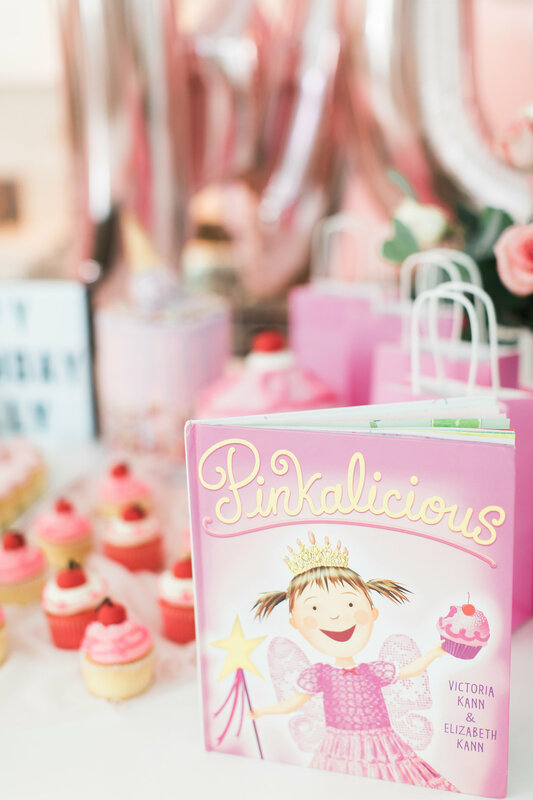 And recently, she’s been very fixated on the pink cupcakes in the book. So I thought how cute would it be to replicate those cupcakes for her party. I feel like Molly thought she was transported into the book! 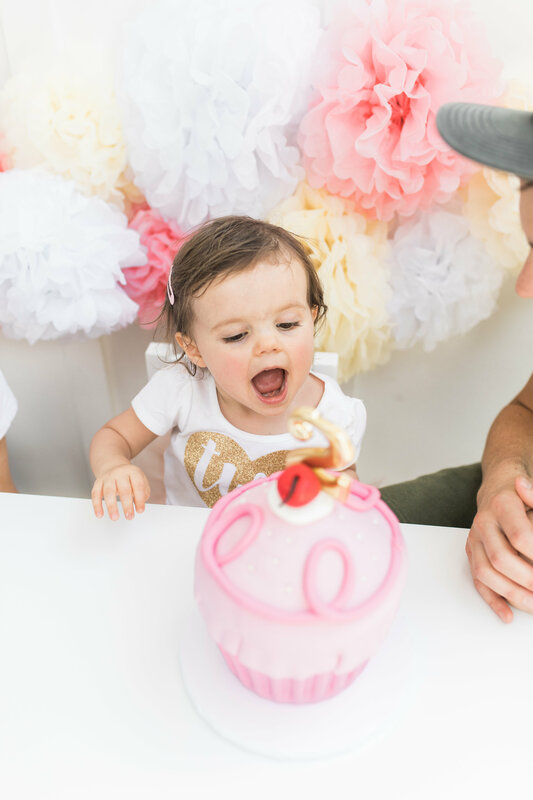 She couldn’t believe her eyes when she saw all the adorable pink cupcakes at her party. We got them from a bakery called Polkatots in Pasadena. They make the most incredible cakes and cupcakes! Not only do they look absolutely beautiful but they’re pretty damn tasty too. 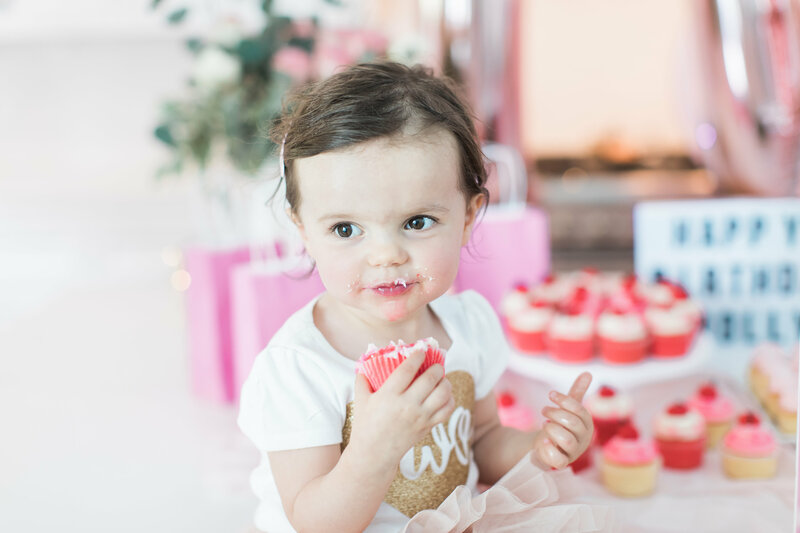 I’m not ashamed to admit I think I ate three cupcakes at her party. And they made her a mini cake/ large cupcake version of the cupcakes in the book as well. It looks JUST like the cupcakes in the book does t it?!?! 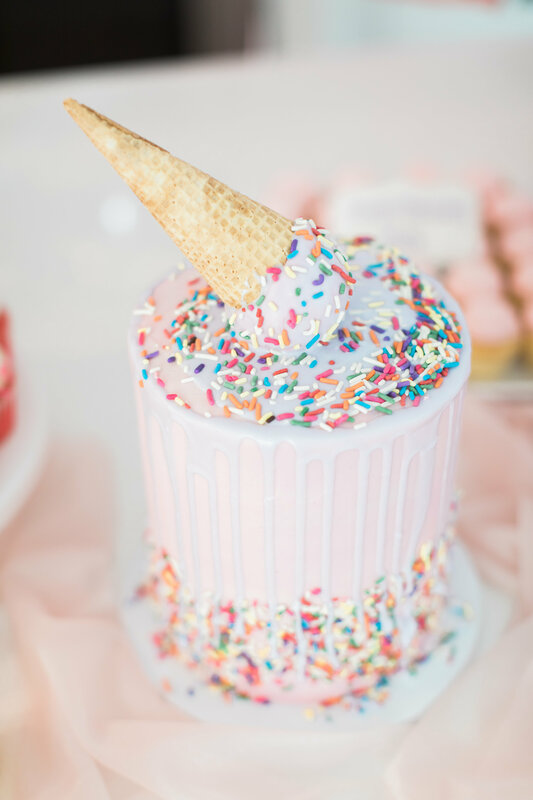 We wanted to have a cake for the adults too, so we also got this super pretty dripping ice cream cone cake. However, the adults never stood a chance since the kids ended up digging their hands into that one too. Ha! The rest of the party was pretty simple. I got some decorations from Amazon, I had this pink tutu that I bought earlier in the month because I got the adult matching one and I wanted to match with her. So I just bought this “two” shirt online to go with it. I bought a ton of balloons including ones that spell the word two. When decorating for a party all I feel like you really need is to buy a ton of balloons to decorate and have them displayed all over the place. It’s such an easy way to decorate. 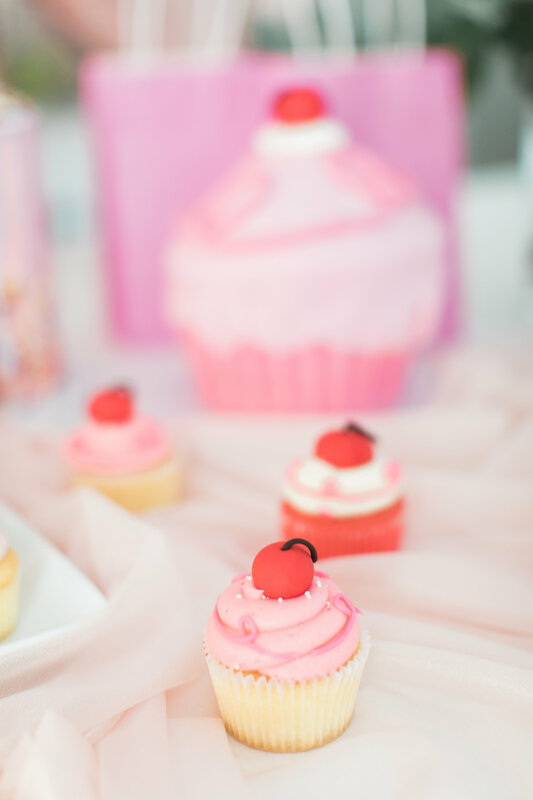 I think I got the pink gift bags from the dollar store and added a pink table runner to the dessert table to make it feel more full. And that’s really it! 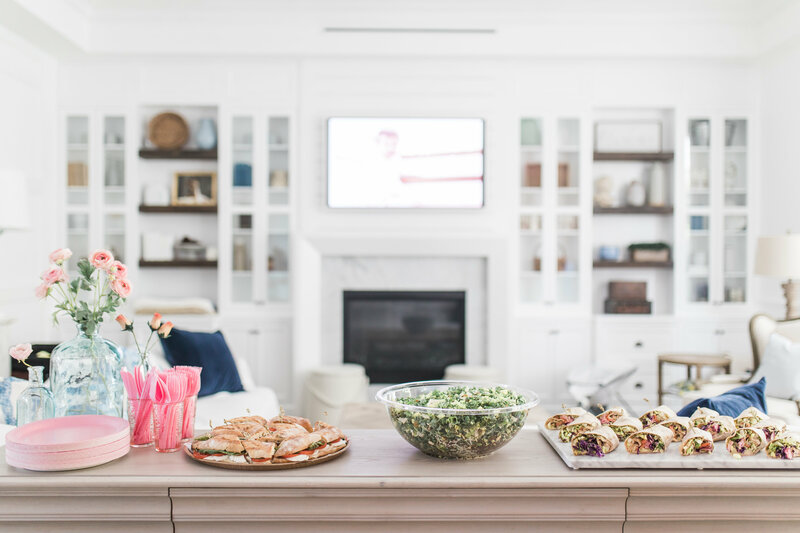 And I think if you’re planning a party for your kiddo you really don’t need to stick completely to a theme. Molly loves Pinkalicious so that was our main theme but as many of you know who follow me on Instagram, Molly is absolutely obsessed with Elmo too so we really combined themes! 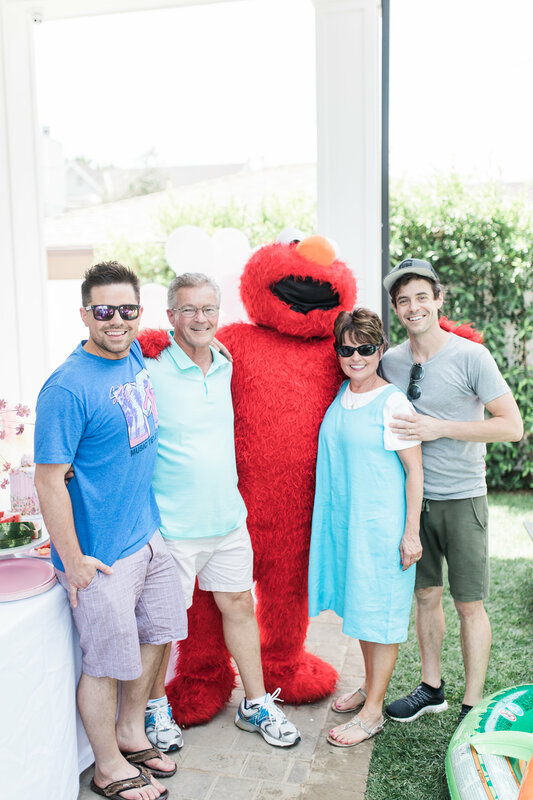 Having a life-size Elmo entertainer come to the party was so much fun! We feel pretty bad for big Elmo because it was about 95° that day. But we purposefully only hired him for 30 minutes instead of an hour because we didn’t want him to have to be outside in the heat for longer than 30 minutes. Plus we kept him in the shade! Poor Elmo! But having him come was absolutely amazing! Molly’s Uncle Ryan and Aunt Jill hired him as a gift to her! When he first came into the party Molly was so surprised! She quickly ran over to him and couldn’t believe her eyes. Kevin and I both started crying in that moment. I’m not even kidding! It was just so special for us to see how excited she was to meet her idol! After that, she got a little bit unsure of him and definitely didn’t want him picking her up. But even though she was unsure at times when he was here, she hasn’t stopped talking about him since. She’s always telling us how Elmo came to her party and danced! It’s a memory I know she’ll carry with her for a long time. And at the end of the party we measured her height! We did the same thing at her party last year. 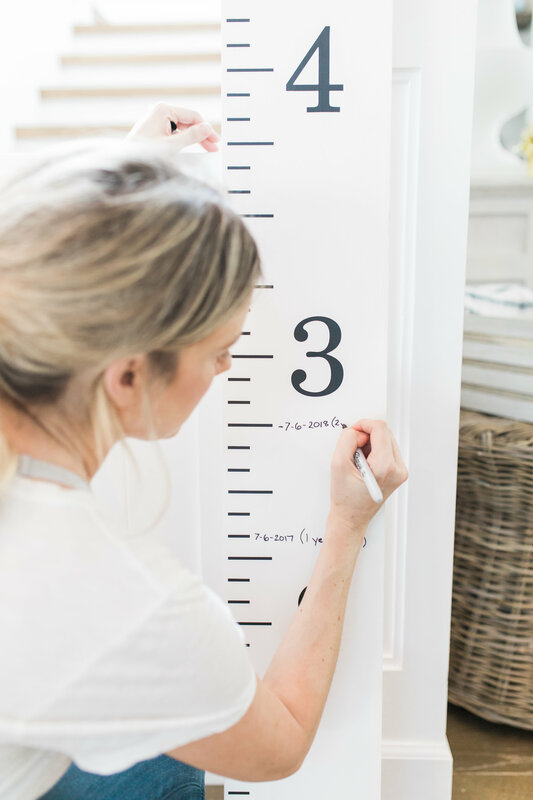 We love that we have this personalized growth chart that we can use to track her growth each year! It’s so crazy to see how much she has grown in just a year! And that’s really it. Sorry if this blog post seems a bit scatterbrained. To be honest with you I am completely exhausted right now while writing it, but wanted to get something up before too much time had passed! 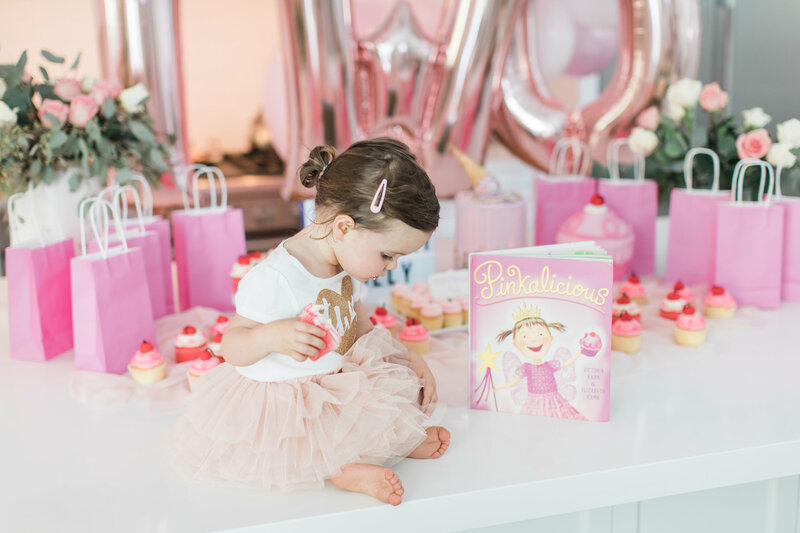 And really I just wanted an excuse to share these super cute photos from her party! 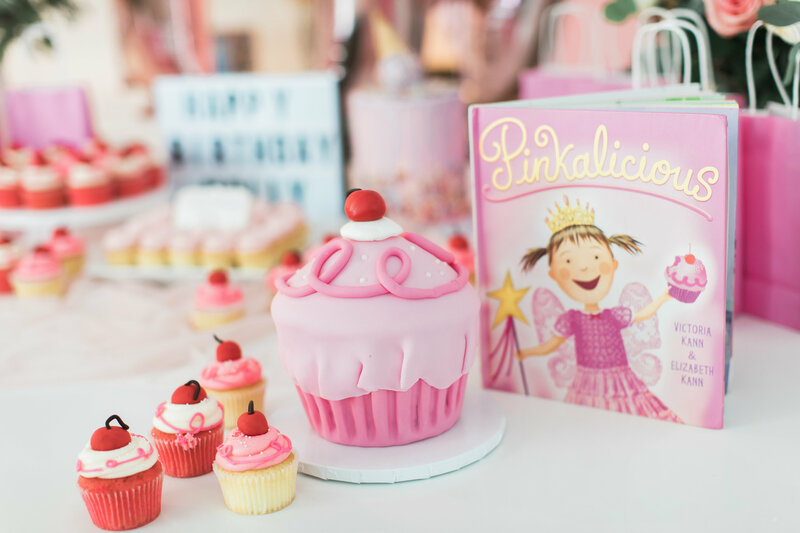 Hope it gives you guys some inspiration for your little ones next birthday party! Here are a bunch of photos form the fun day with friends and family! Love it! I don’t think you really need anything more than elaborate or expensive for a two year olds party. I ordered stuff from amazon and target for my nephews party using the woodland fox colors. I actually found a fox ballon on Etsy I liked that stared it all but the Fox was $250 and would take 3 weeks I didn’t have so I opted just to use the colors as the theme. $250 for a balloon?!?!?! Am I reading that right?! Adorable! My two year old loves that book (and Elmo) too. What are some of her other favorite books? We also really like Princesses Wears Pants! It’s another cute one. And ps, my daughters are 4 months and 26 months, so I can relate on having no time. It’s hard! She loves Goodnight Cubs, Goodnight Moon and Goodnight Daniel Tiger! I’ve heard about this place! I sooooo wish we could go. But anytime I’m on the East Coast we go see my family so I don’t think this is in the cards for us. Who knows. Maybe! 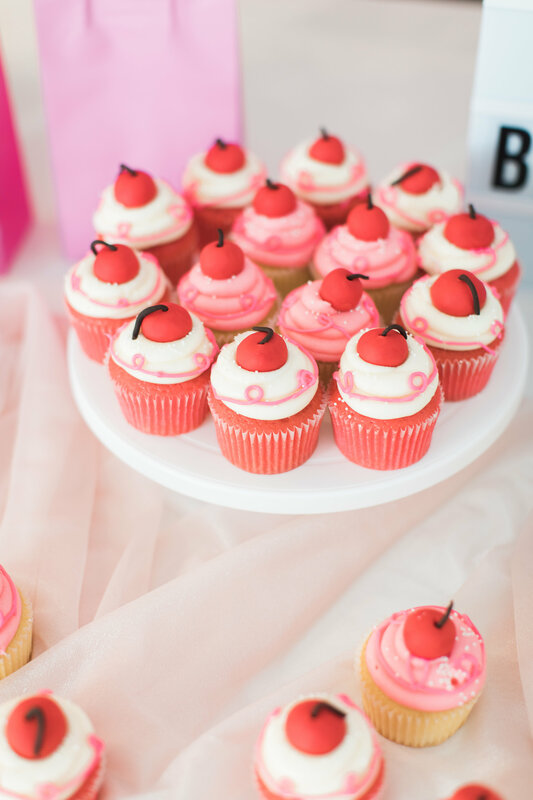 Omg those cupcakes!! So freaking cute! 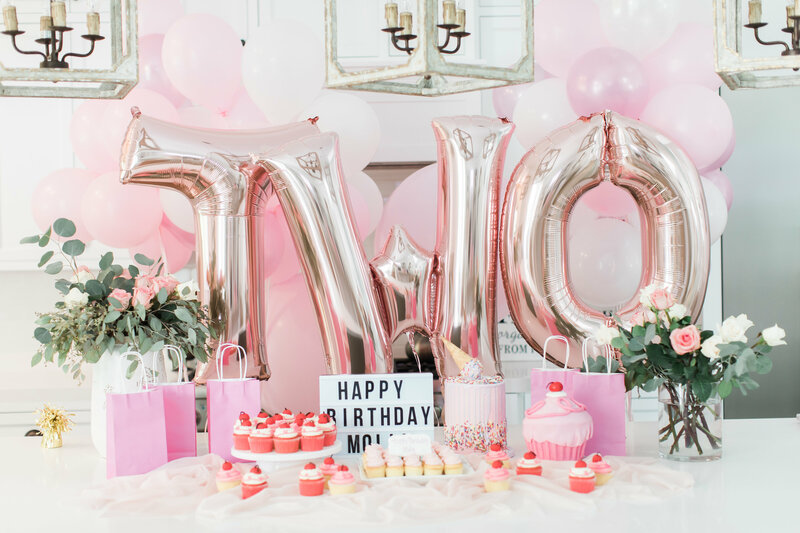 Such a good idea for a two year olds party just simple and something that she loves. Everything looked so adorable!! 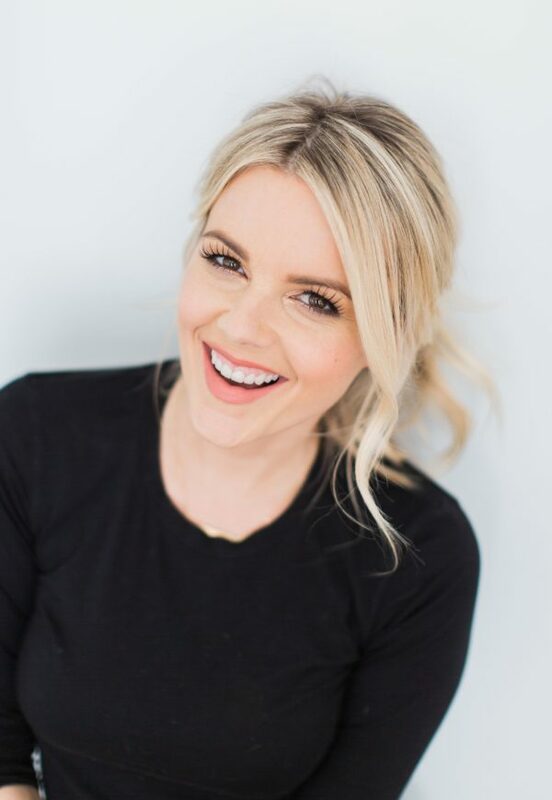 Thank you Lindsay! 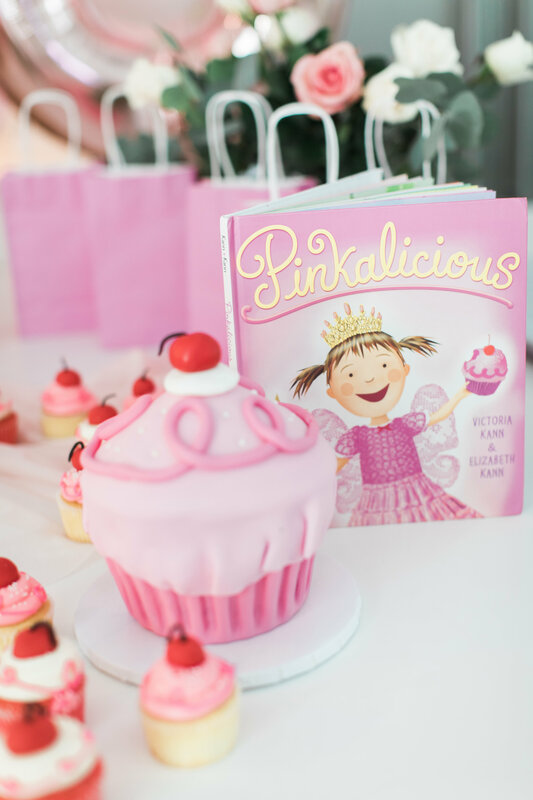 She COULD NOT believe that she was eating the Pinkalicious cupcakes! I think she thought she would turn pink just like in the book! Thanks Charmaine! 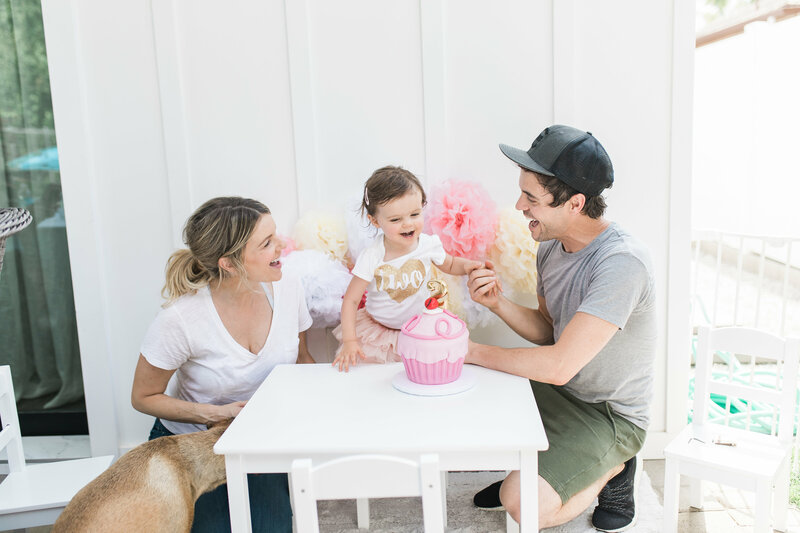 My goal was not to spend too much this year because we spent too much on her first birthday. Molly’s party looks amazing! I saw Camila Cabello perform this weekend and kept thinking of Molly while Camila was singing “Havana”! Man, can we get Camila to perform at her 3rd birthday party 😉 Ha! What books does Molly loves besides this one? She loves Goodnight Daniel Tiger, Goodnight Cubs, and Goodnight Moon. Pretty much anything with “Goodnight” in the title. Ha! Where is Molly’s adorable pink polka dot bathing suit from? Aww!! Cried just reading the Elmo part, Haha. It definitely looks like she had a blast! You always get more when simple so.. it was a total success!! PS: I’ve loved Riley’s giggles and smiles. Too cute!!! I definitely want to get her into dance. We are just all so busy and overwhelmed right now with the two of them that I can’t manage it right now. But I will soon! So stinkin cute! 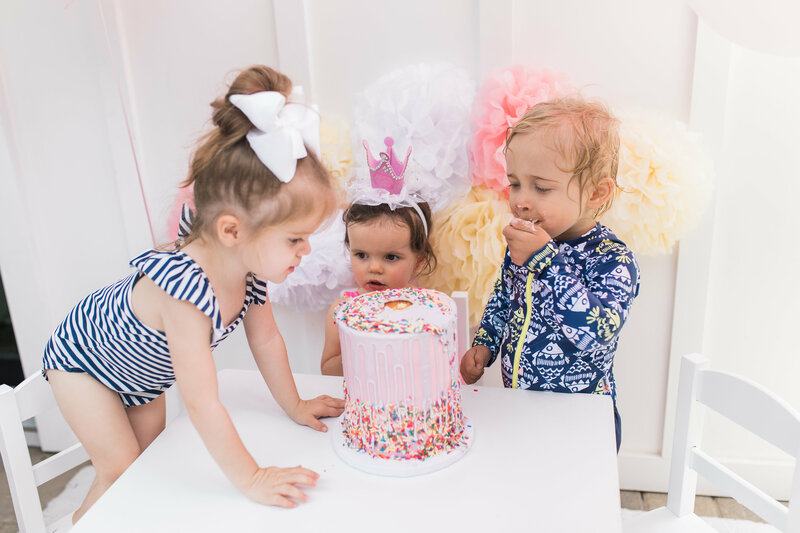 My daughter is 5 now – but for her second birthday, we did “Harper’s Ice Cream Shop”, it was my most favorite theme ever! My husband drew and cut out of cardboard a pink and white awning (I painted it) and I made out of cardboard, the sign to her shop that say under the awning. 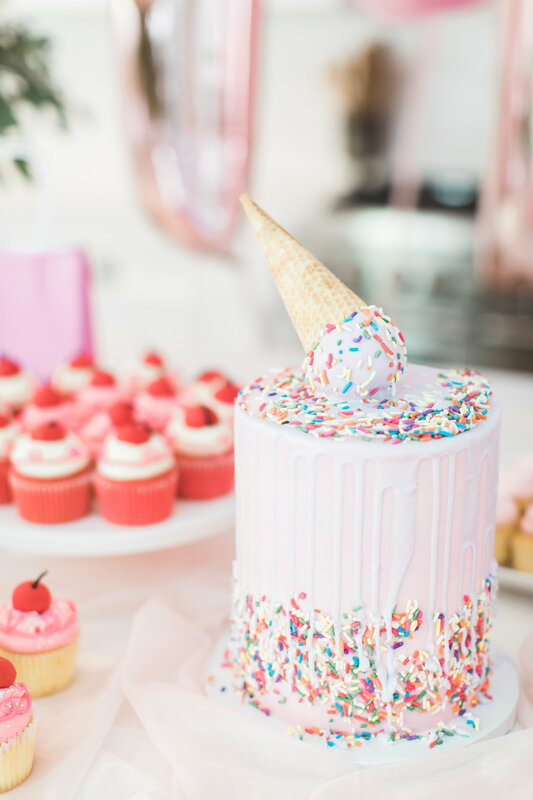 I made an ice cream cone shaped cake out of cupcakes and we had an ice cream bar, with all the toppings and even ice cream sodas. We went overboard with decorations and balloons but it was so much fun! Planning parties is a lot of work, especially with two (or more) kids. Great job!! So sweet! All the pink is making me want a girl! The cake is so cute and your pendants?!?! Do you mind me asking where you got them? And while I’m asking, the color of your front door 😉? What amazing ideas! You did a great job in just two days! Molly is just so adorable! Hi Ali, I noticed all the regular food looked good too. What did you have? Looks like a salad and some yummy sandwiches. Would love to hear all about that, and this was the cutest party and I give you kudos for putting it together in 2 days. Will have to check the cupcake place out as I live near Pasadena. 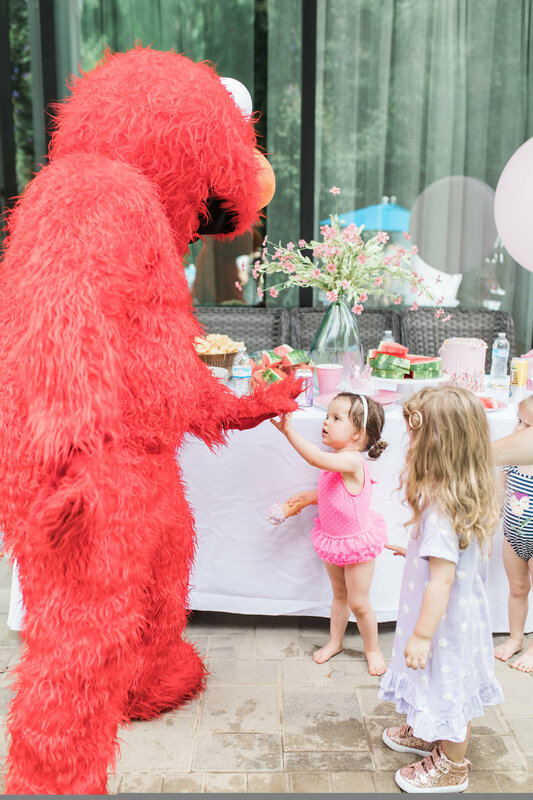 My daughter turns 2 on Sunday and we’re having an “Abby Elmo Birthday Party” (what she says) because she’s obsessed with both characters. We talked about getting an Elmo costume and now I’m really wishing we had. I have a ten week old so this party is definitely low key too. I’m loving following your transition to two since I’m going through it as well. I’m not sure I’ve ever been so tired in my life! Oh my goodness, stop it right now! 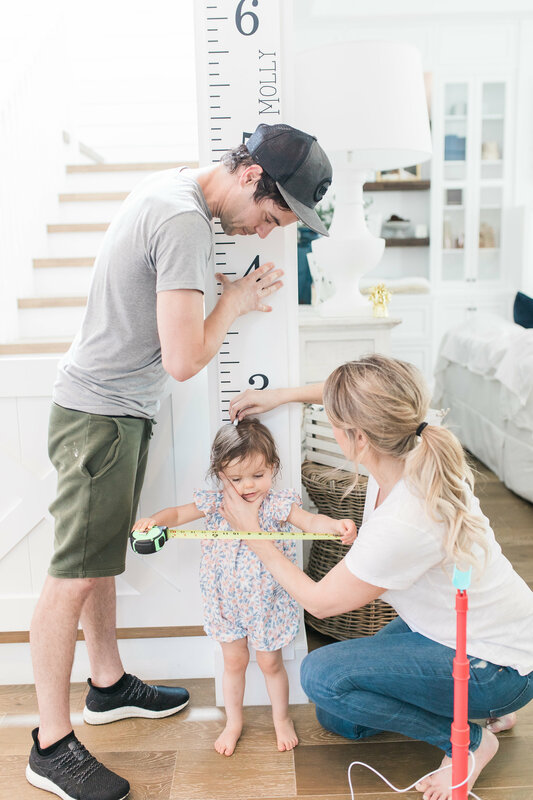 First of all – Molly couldn’t be any cuter but HOW did she grow so much since you last marked her height?! It’s so crazy. 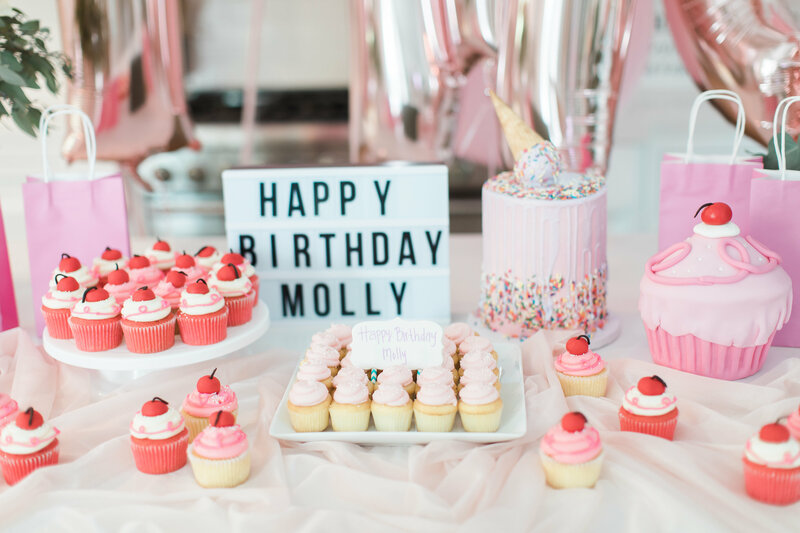 Can u please tell me where can i get that white board that says happy birthday molly?